Flax, or linseed, has been cultivated for centuries. Its fibers were used to make linen in ancient Egypt. More recently, flax seeds have become popular among health-conscious consumers. Several studies suggest that it may help reduce the risk of heart disease, cancer, stroke and diabetes. Flax contains high levels of three nutrients that are good for our health. Many Americans don’t eat enough fiber, which is found in whole grains and other plant foods but not in the white flour and white rice we tend to favor. Flax seeds are high in fiber, containing about 8 grams per tablespoon. To put this in perspective, the recommended adequate intake (AI) is 14 grams per 1,000 calories, or 25 grams per day for women and 38 grams per day for men . Fiber functions to keep the bowels regular and encourages a healthy microbiome — it feeds the bugs in our guts (the microbes that inhabit our intestines). Microbiome: the collection of microbes — bacteria, viruses and single-cell eukaryotes — their genetic elements (genomes), and environmental interactions in a particular environment. Microbes in a healthy human adult are estimated to outnumber human cells by a ratio of ten to one and may account for up to five pounds of adult body weight. Omega-3 fatty acids are essential, meaning that we must ingest them through our diet because our body cannot generate them. Omega-3 fatty acids have many positive effects on the body, including anti-inflammatory and anti-blood clotting actions, lowering cholesterol and triglyceride levels, and reducing blood pressure. They come in three varieties: the shorter chain alpha-linolenic acid (ALA), and the longer chain docosahexaenoic acid (DHA) and eicosapentanoic acid (EPA). Flax contains only ALA, which is the most difficult for the body to utilize. It thus cannot substitute for fish, which contains the longer chains as well. There is roughly 1.8 grams of ALA in a tablespoon of ground flax. It’s currently recommended that you consume 7-11 grams of omega-3 fatty acids each week. Seeds from the chia, a species of flowering plant in the mint family, also contain a lot of ALA. They were traditionally cultivated primarily in Mexico and South America, whereas flax was grown around the Mediterranean, in Europe and Northern Africa. Flax seeds are also high in lignans, estrogen-like compounds found in plants that can act as antioxidants. 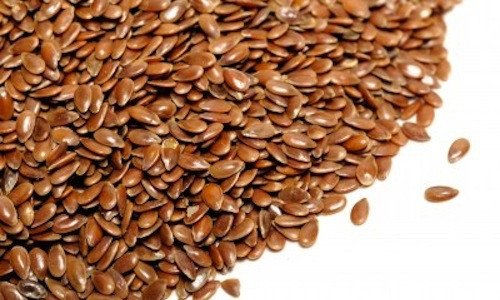 A combination of lignans, omega-3 fatty acids and fiber is thought to account for flax’s cholesterol lowering effects. These nutrients are good for your heart and brain. Whole flax seeds, ground flax seeds, and flax oil are all readily available. Which offers the greatest health benefits? The flax seed is coated with a hard outer shell that we cannot digest, so consuming them whole does not confer the greatest benefit. Flax oil contains only the omega-3’s, not the fiber or lignans. Thus, incorporating ground flax into your diet is the best way to take advantage of all it has to offer. However, ground flax goes rancid and loses its potency very quickly; heat, light and oxygen all conspire to break down the polyunsaturated fatty acids (like ALA) it contains. So buy whole flax — brown or golden, it doesn’t matter — and store it in an airtight, opaque container in the fridge or freezer. Don’t use a metal container because metal can contribute to fat breakdown. When you’re ready to prepare flax seed, grind it in a coffee grinder right before use. Throw it into oatmeal, granola, chopped meat, or any type of baked item. Most experts recommend 1-4 tablespoons of ground flax per day, but if your body is not accustomed to this much fiber it is best to start slowly. Pregnant and nursing women should not consume flax because its effects have not been adequately studied and defined. MayoClinic: Ground flaxseed, Better than whole? Eating Well: Are store-bought pre-ground flaxseeds as nutritionally effective as buying whole seeds and grinding yourself? Paleo Diet Lifestyle: Are Nuts and Seeds Healthy? Dietary Guidelines for Americans, 2010. United States Department of Agriculture Center for Nutrition Policy and Promotion. 2011 Jan 31.